The 2018 Academy Sports + Outdoor Texas Bowl! The beautiful NRG Stadium was filled with excited fans and incredible athletes at one of the greatest games of 2018! SERVPRO had the amazing opportunity to sponsor and experience the 2018 Academy Sports + Outdoor Texas Bowl! SERVPRO had the tremendous opportunity to provide lunch and show our appreciation for Village Fire Department! We are so thankful for their everyday service and dedication to the Houston community! The cheerleaders lit up the NRG stadium with their team spirit at the 2018 Academy Sports + Outdoor Texas Bowl! Many energetic fans joined in to help cheer on their favorite team! 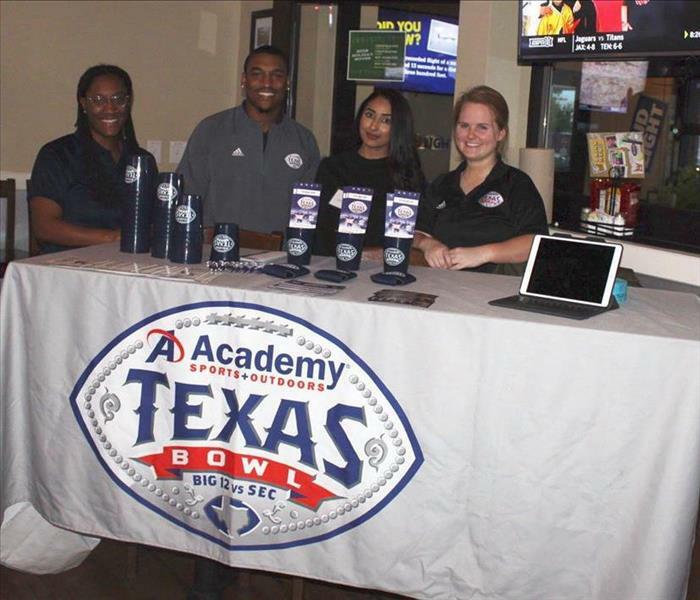 Pluckers Wing Bar and Karbach Brewing Co. presented a Happy Hour Huddle for the Academy Sports + Outdoor Texas Bowl and SERVPRO was in attendance! The social event offered great food and a chance to win Texas Bowl tickets! Our annual Christmas party was a huge success! 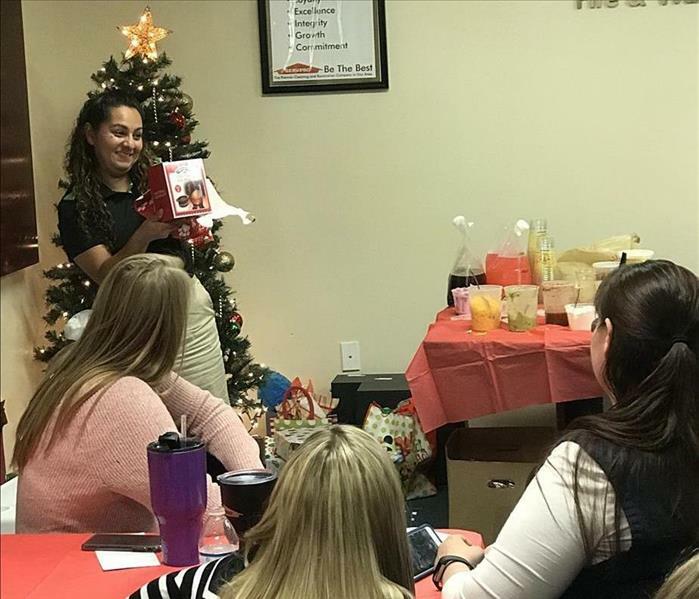 All employees joined together to celebrate the holidays by playing fun games, exchanging gifts and eating a lot of delicious food and treats! 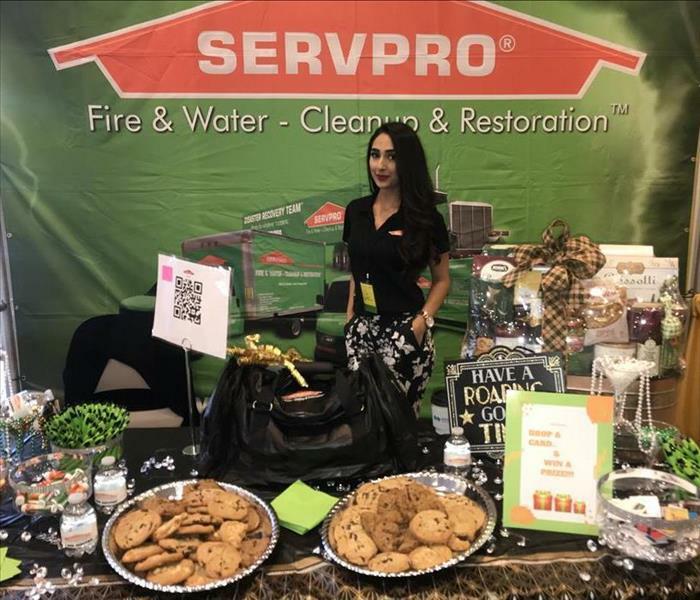 SERVPRO attended the phenomenal 2019 Trade show! Our booth was painted green and orange and offered tons of informative pamphlets, fun gifts, prizes and tasty treats for the amazing guests! This room suffered from significant water damage. The flooring was removed along with all the belongings. SERVPRO responded and began the mitigation process. The room was dried and rebuilt back to normal conditions. After a pipe break, there was multiple rooms that suffered from water loss. 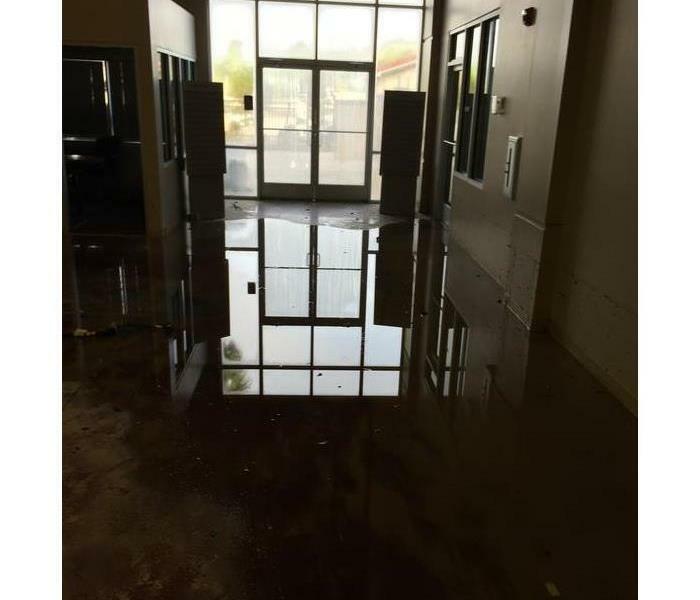 There was significant water standing in the floor. SERVPRO responded and began mitigation procedures. They were able to dry the floor and quickly rebuild the affected areas. The disaster relief team is ready for any size disaster in your area for restoration emergency. The team can respond quickly with professional drying equipment to restore your property quickly back to normal conditions. Contact us anytime 24/7/365. The Diaster Recovery Team can respond to any type of water, fire, mold, or storm emergency. The team is ready quickly and will show up to restore your property back to normal conditions. A clean water source such as a supply line or sink overflow allows SERVPRO of Kingwood/Humble to save the carpet. We did remove the pad underneath and roll back the carpet to help the cement dry out. We will be able to replace the pad and re-stretch the carpet back into place. A supply line to the ice maker had malfunctioned in this Crosby home flooding the main floor. Our Equipment did the job to dry out the floors and walls without needing to tear out the wet material. 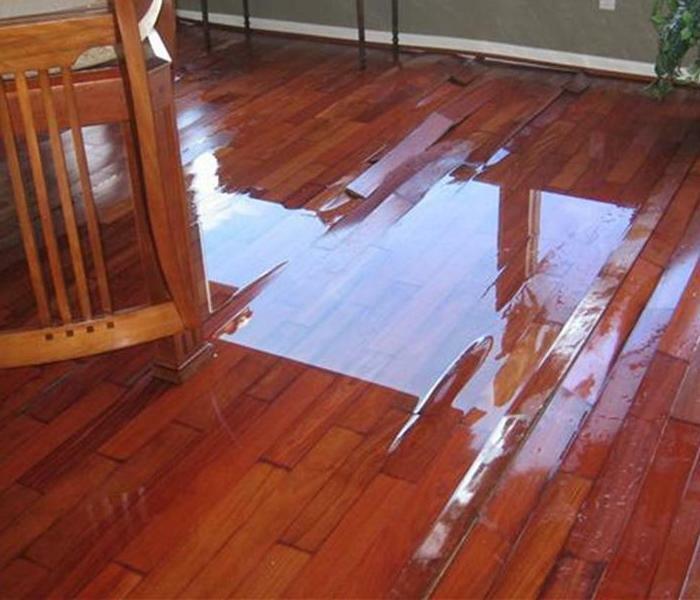 Call us at (281) 219-8180 if you have a flooded home due to a supply line. Flood cuts are used when flooding has occurred in a business or home. Cutting out the contaminated materials. SERVPRO of Kingwood/Humble has certifications with the IICRC. A third party certification organization for the restoration industry. Flooding is wat casueel this theater to have sand and bacteria all through its halls. The water needed to be pumped and drained from the auditoriums because there was two feet of water gathered there. SERVPRO of Kingwood/Humble are ready to do any size job. The picture doesn't do it much justice but there is mold growing on this piano as well as along the baseboards. A water leak can cause humidity to rise in the room giving settled mold spores enough to begin to sprout. Mold can cause damage on any porous material, especially if they are made with any organic materials. SERVPRO of Kingwood/Humble services the Houston area and its surroundings for mold, fire, and flood damages. This home had a severe fire damage. When the couple called their insurance they recognized the name SERVPRO and opted to call us. We were glad to do their wok. Call us at (281) 219-8180 if you have a fire restoration need. The lockers had been cleaned after a fire. They were now being covered to keep the building materials from getting them dirty again. The fire and smoke that ruined the ceilings will soon look "Like it never even happened." 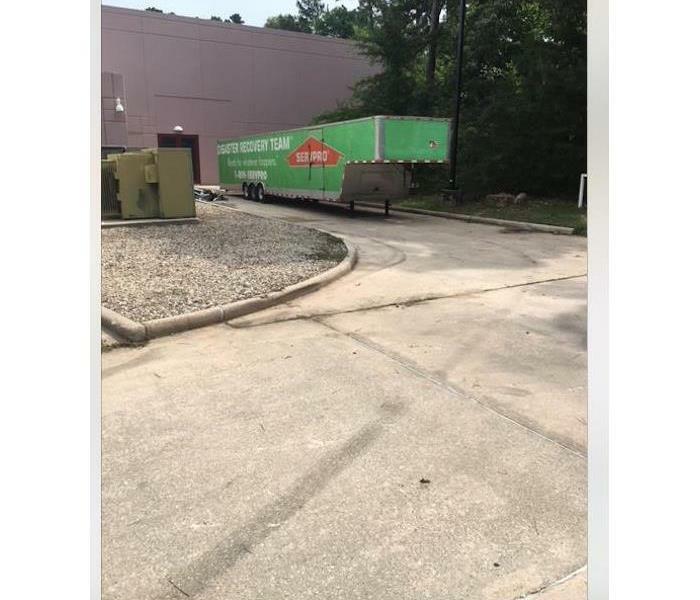 SERVPRO of Kingwood/Humble was called to help out this business in their time of need. This is what we live for. We enjoy helping businesses stay in business with quick response and a highly trained team. Call us at (281) 219-8180 if you would like to speak to a representative about our services. This church had significant water damage that we had to remove all carpet and clean. We used a commercial desiccant to help dry quickly and efficiently. Our team specializes in large loss restoration and have the team and equipment to handle any size loss. On large jobs we have several commercial desiccants that can help remove large levels of moisture and expedite the drying process. If you have any questions about commercial water losses and the drying process let us know. This school had significant mold damage after a fire loss. This was probably due to the amount of water that was used to put the fire out. Our team carefully assessed the situation and followed recommendations to mitigate. 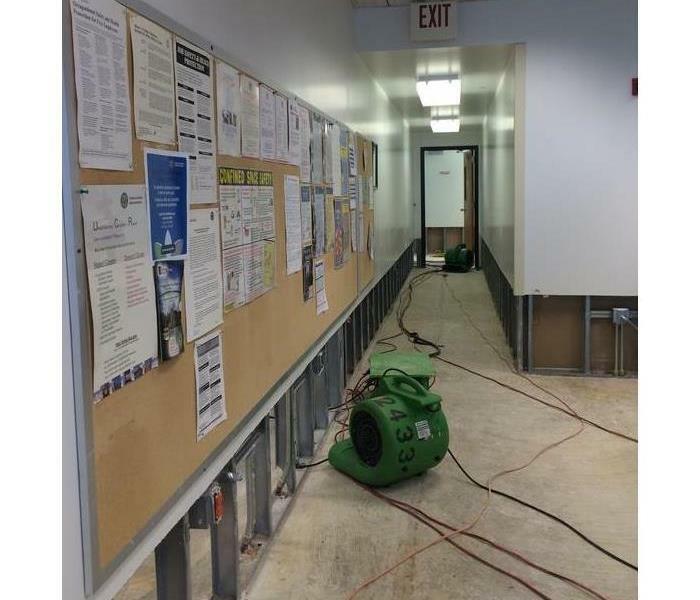 SERVPRO responding to a water loss in a commercial airport. We extracted and starting the drying process immediately. Our team documented this job carefully for the client to have adequate records of before, during and after. Our team discovered mold behind this baseboard and quickly followed the protocol to remediate. We had everything tested and then followed the directions line by line to make sure things were done the right way. Here is a classroom photo that had a lot of fire and smoke damage. Our team was on site and began mitigating the damages immediately. If you have any questions about fire or water losses, let us know. This is some mold damage that was found after a fire and water damage situation. This is typical if water has been siting for a few days, allowing the microbial growth to start growing. Let us know if you have any questions. Here are some pieces of a bathroom from a fire damage in a school. Our team was quick to respond and start the cleaning and repair process. We made sure to take lots of photos before, during and after. Here is a bathroom in a school that had major fire damage. Our commercial large loss team was quick to respond and begin the mitigation process. 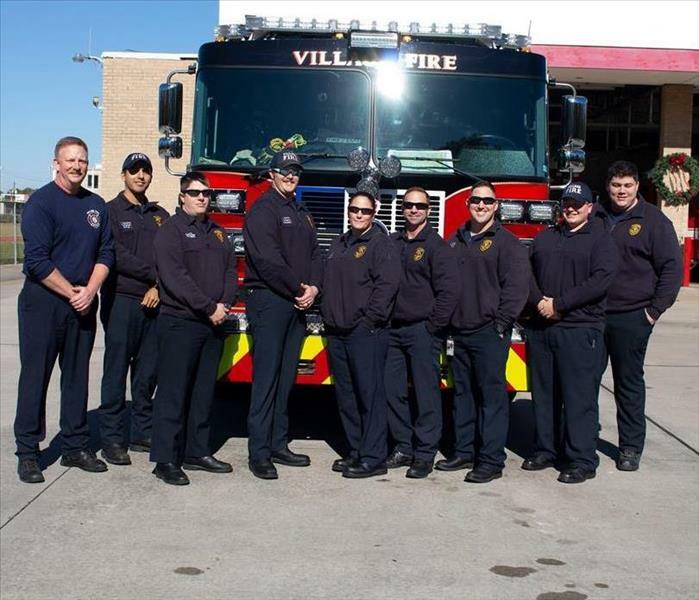 If you have any questions about our large loss fire team, feel free to reach out. Here is a picture after our team cleaned the movie theater that was flooded from a major storm. We were quick to respond, extract and demo everything that needed to come out in order to begin the rebuild process. 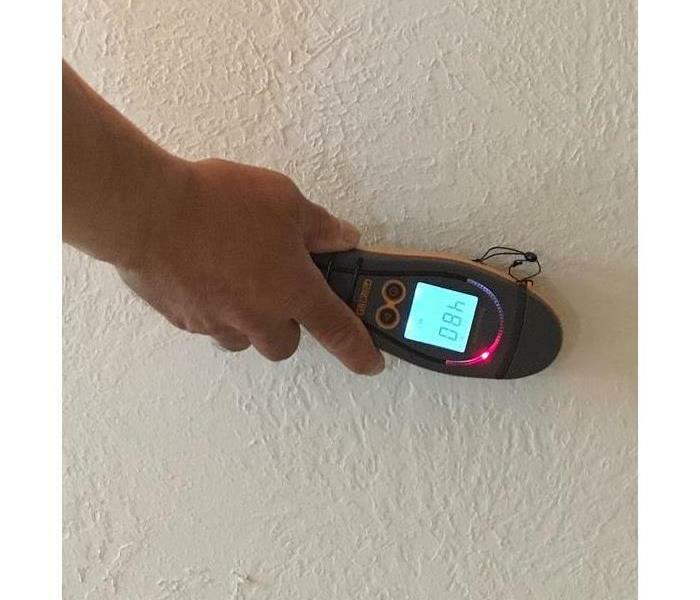 Drywall can wick up an inch of water an hour during a water loss. It is important to know who to call in order to lesson the damage water intrusion. SERVPRO is available at anytime to respond to a water loss. Here is our storm team in action working a major flood in the Louisiana area. We were quick to respond and brought lots of equipment and manpower. If you have any questions how our Extreme Response Team can help feel free to reach out to us at anytime. When carpet sits in standing water the glue backing starts to deteriorate from the carpet fibers. The carpet is then considered delaminated and will no longer be able to stay stretched, causing ripples and bubbles within a room. 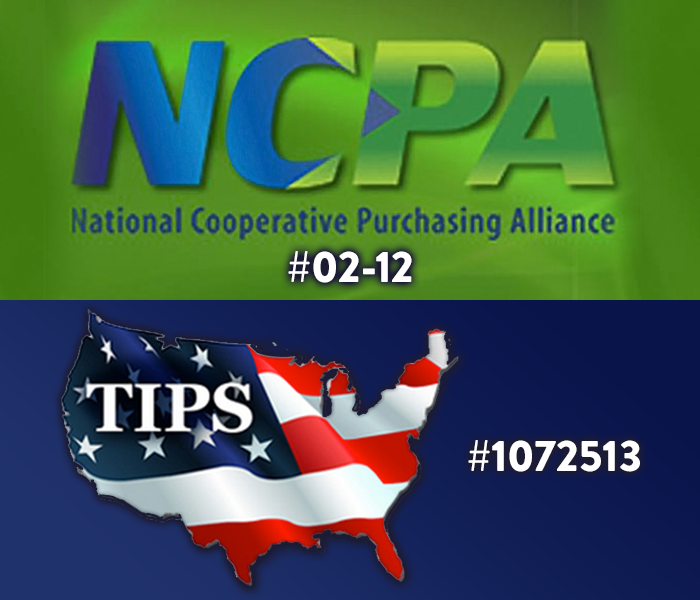 SERVPRO Extreme Response Team is pleased to inform you that SERVPRO was accepted by the National Cooperative Purchase Agreement (NCPA) in the "Fire and Water Disaster Restoration” category as a vendor. Houston mold damage can cause significant property damage. There can also be adverse health effects from allergens and irritants produced by mold. 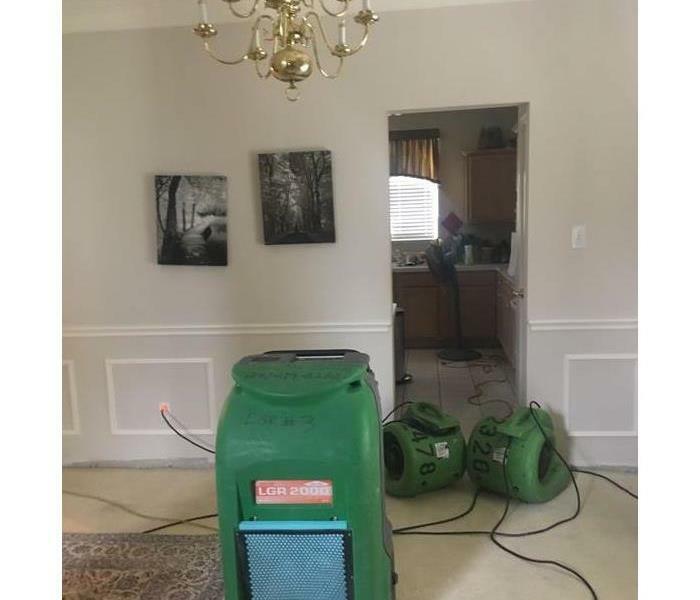 SERVPRO of Kingwood-Humble understands mold and they have the training and equipment to remediate mold infestations like the one pictured here. SERVPRO of Kingwood-Humble is available 24 hours a day 7 days a week for your emergency. Call (281) 219-8180. 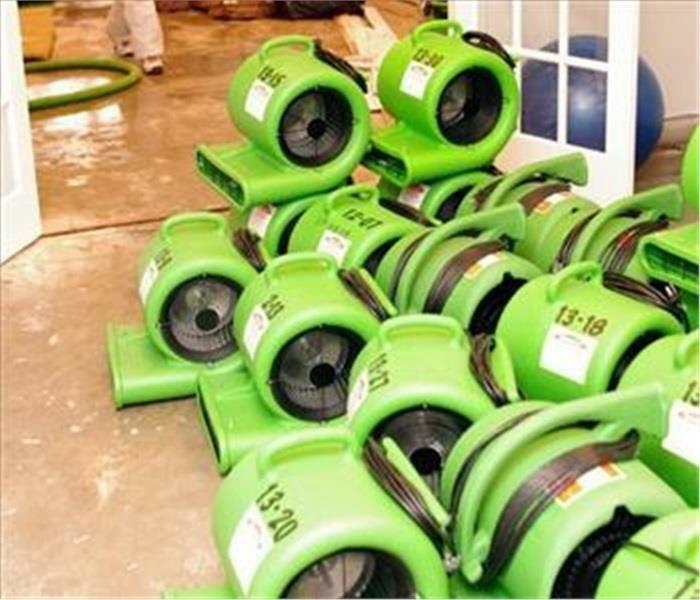 SERVPRO of Kingwood-Humble uses advanced equipment to mitigate fire damage in Houston. 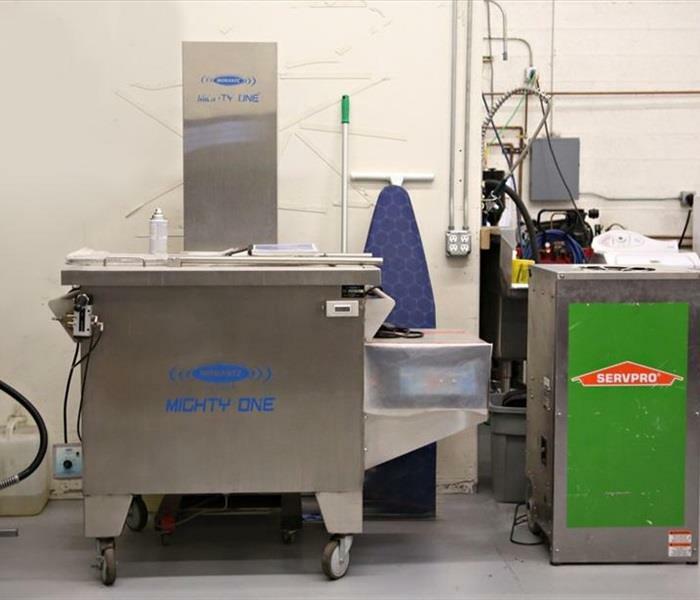 Pictured here is an ultrasonic cleaner which for cleaning contents from fire, water, and mold damage. Ultrasonic cleaning produces a more thorough cleaning than does hand cleaning. SERVPRO of Kingwood-Humble is available 24 hours a day 7 days a week for your emergency. Call (281 )219-8180. The warping and buckling from Houston water damage is apparent in this photo. 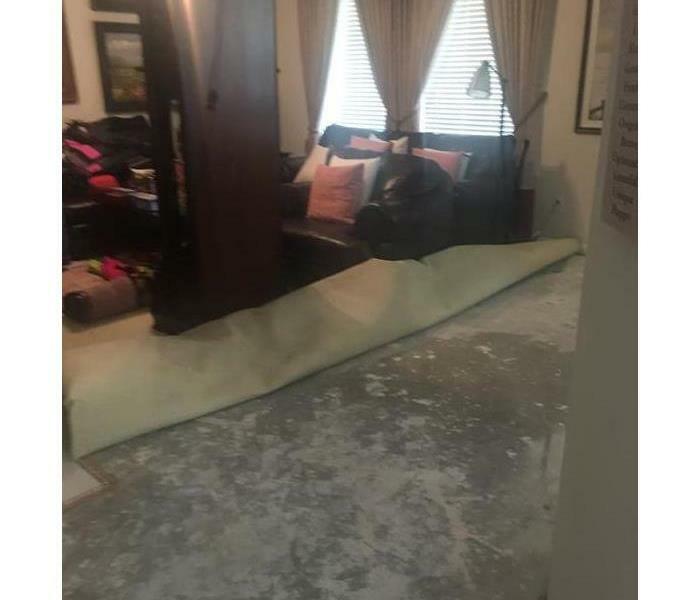 The owner of this home chose SERVPRO of Kingwood-Humble due to their experience and reputation in handling this type of damage. A water extraction plan was executed and then the damaged flooring needed to be removed. High tech commercial drying equipment was then employed. Finally the floor was replaced. SERVPRO of Kingwood-Humble is available 24 hours a day 7 days a week for your emergency. Call (281) 219-8180. This Houston flood damage was quite a large job. It required a quick response to prevent additional damage. You see here a large number of drying units prepped and ready to begin the drying phase of this flood damage. The owner sought out a company that could respond immediately, possessed the expertise for the job at hand, and had the resources available to finish the job quickly and correctly. SERVPRO of Kingwood-Humble was chosen. They are ready to help 24/7. If you have a flood damage issue in the Houston area call (281) 219-8180. As we hitch up our trailers and pull down the zippers our Tyvek jumpsuits. We wish our best to the people of Louisiana. We truly appreciate the opportunity to come in and make a difference for not just one but for all. As representatives under one roof, we joined together as one to aid in relief during disaster. Along with the experience, we gain much appreciation for life. With much gratitude we enjoying bringing life back to those displaced. Special Thank you to our now lifelong friends at The Dixie RV & Jubin’s Crossing Movie Tavern. We Thank You Louisiana!